A potential Donald Trump presidency terrifies people worldwide. Hisracism, bullying, and enthusiasm for violence are a great concern for onlookers. But we see a positive in Trump’s candidacy: we can improve our critical thinking by using him as an example of how people spread misinformation. And there is no shortage of material to work with, given Trump’s firehose of falsehoods. Politifact found that 78% of Trump’s statements were mostly false, false, or “pants on fire” (the most extreme form of false). Fact-checking websites, parodyvideos, and even a debunking speech by former governor Mitt Romney have highlighted his misinformation. But pundits and political scientists are mystified that this hasn’t hurt his level of support, with fact-checking efforts sometimes helping Trump and energising his supporters. Psychologists are quite familiar with the fact that die-hard supporters of an idea aren’t swayed by contrary evidence, which can backfire and strengthen preexisting attitudes. Indeed, trying to change the minds of headstrong Trump supporters may be largely futile. Communicating to the larger majority who are still open-minded to facts is more effective. Psychological research on science denial provides a model for how to reduce Trump’s influence on the general populace: inoculation theory. This uses the metaphor of vaccination. Vaccines stop viruses from spreading through inoculation, which is when when healthy people are injected with a weak form of a virus and then build immunity to the virus. Which issue do you want US election candidates to discuss? The inoculation theory applies the same principle to knowledge. Research has found we can make people “immune” to misinformation using the fact-myth-fallacy approach. In this method, we first explain the facts, then introduce a related myth, and then explain the technique the myth uses to distort the facts. By understanding the technique used to create the myth, people are exposed to a “weakened form” of the misinformation. Science deniers use five techniques to distort facts: fake experts, logical fallacies, impossible expectations, cherry picking evidence, and conspiracy theories. The acronym FLICC is an easy way to remember these techniques. Let’s take a look at some examples of Trump’s FLICC-laden arguments. The fake expert strategy occurs when people claim to be experts despite having little or no relevant expertise. Logical fallacies cover a variety of techniques, from distracting red herrings to Trump’s favourite, ad hominem attacks, ie attacking a person’s character rather than their ideas (you’ll find many examples on Twitter and in his speeches). Impossible expectations involves demanding unrealistic or unreasonable standards of proof. For example, while the planet has been warming for decades, that doesn’t mean winter will stop happening or that places will no longer experience cold periods. Arguing that cold weather disproves global warming is like arguing that feeling full after a large meal disproves global hunger. Both climate science denialists and Trump are known to entertain a variety of conspiracy theories. For example, Trump has been a big proponent of the birther theory about Obama’s birthplace). Donald Trump is highly unpopular among Hispanics. This should come as no surprise given his constant refrain for a wall along the Mexican border, as well as his characterisation that Mexicans crossing the border are drug traffickers and rapists. A recent Gallup survey found 77% of Hispanics view Trump unfavourably. This is the highest disapproval rating among all presidential candidates. Contradicting these statistics, Trump falsely claims that Latinos love him. At one rally, Trump brought an enthusiastic Colombian woman on stage to share her support. Trump uses the cherry picking technique to distort the facts. He paints a misleading picture by highlighting a single example and ignoring contradicting information. This inoculation approach gives people the critical thinking skills to assess arguments and determine what information to believe. 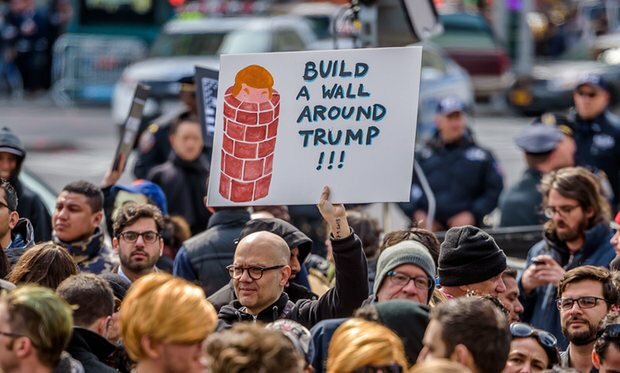 Is this the solution to stop Trump? Given similarities between science denial and Trump support, could we apply inoculation theory to stop Trump? It’s difficult to say. Inoculation research has mainly been applied to areas of knowledge that are quite different to the complicated political arena. Trump’s support is not as simple as distinguishing between a fact and a myth. When it comes to voting patterns, political affiliations interact with ideology, religion and many other factors, including dissatisfaction with the political establishment – a dominant theme in this election cycle. Promisingly, inoculation has been found to be effective in neutralising political attack messages. But whether inoculation would prevent Trump’s influence from spreading beyond his core followers is an unanswered question. Even if examining Trump’s arguments using the inoculation approach has a minimal effect on the political landscape, at least Trump’s candidacy can help strengthen our critical thinking skills.